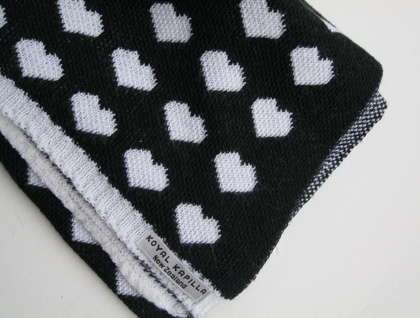 A beautiful knitted baby blanket in jacard patterned of Hearts - patterned hearts one side and birds eye check on reverse. Striking colour in black & white. Limited edition. Merino & Super Soft Fine Wool. Extremely soft and warm with a lovely handle. Designed to keep baby warm and snuggly. Extremely soft, New Zealand merino & supersoft fine wool, perfect as a small blanket in buggies, moses baskets and bassinetts. Compact size approx: 60cm wide by 85 cm length. Perfect for tucking baby in snuggly or using it as a play blanket. Merino & Super Soft Fine Wool are recommonded for babies & toddler. The fibres are much finer and smoother and will not irrate baby's skin. This all natural fibre has many great properties but most important one is maintaing baby's temperature without overheating them or making them cold. This is important as they cannot do this for themselves in the first 6 months.